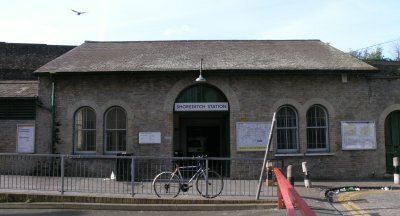 On June 9th 2006, Shoreditch station was closed for the final time. The station has been through many changes in its life, opening in 1876 as part of the London, Brighton & South Coast Railway mainline service, which was expanding its service from Liverpool Street station southwards. The station had two platforms for the twin track railway which continued westwards, joining other mainline tracks running into nearby Liverpool Street station. Services on this stretch of the line varied over the years, but eventually passenger services terminated at Shoreditch in 1913 rather than carrying through to Liverpool Street when the line was electrified, with goods traffic only continuing to Liverpool Street. in 1966, even this service was withdrawn and the junction with the mainline tracks just beyond the station were severed. The line itself has gone through several identity changes. At times, it was seen primarily as a goods line but in 1913, the Metropolitan and Metropolitan District railways started using the line for passenger services. When the London Underground was nationalised, it fell under the jurisdiction of the Metropolitan Line and in 1970 became known as the Metropolitan Line - East London Section. 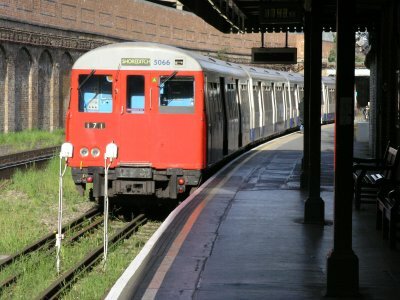 In the 1980s, the line was given its own identity as a separate London Underground line, though in reality to this day it still has a close relationship with the Hammersmith & City (also former Metropolitan Line), even sharing rolling stock. More recently, plans were discussed with regard to extending the East London Line northwards initially to Highbury & Islington and possibly beyond. The route chosen would add 4 new stations - Hoxton, Haggerston, Dalston Interchange and Canonbury along its route and would run along the flyover formerly used by the former North London Railway trackbed from to Dalston Junction. This would however pose a problem - The East London Line bears sharply westwards north of Whitechapel as it headed for its former Liverpool Street station, placing Shoreditch in the wrong aspect to the rest of the extension. The plans were to divert the East London Line north of Shoreditch and onto the abandoned flyover just beyond Whitechapel, making Shoreditch station redundant. Legal authority was eventually granted with a short hitch as Braithwaite viaduct at Bishopsgate Goods Yard, which was to be demolished, as part of the plan had become a listed structure. Primary work on the extension is now well under way with several bridges on the flyover being strengthened and re-built and the announcement of Shoredidtch's closure in 2006 became inevetably closer. 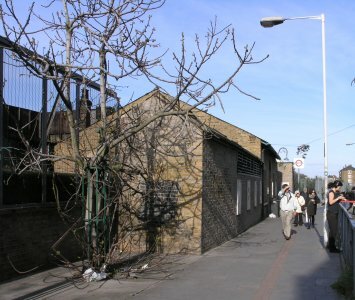 The closure was finally announced in April 2006, with the explanation that the entire East London Line would close in spring 2008, reopening with extensions both to the north to Highbury & Islington and also southwards to West Croydon and Crystal Palace. The terminus at West Croydon would provide the second direct link with the Croydon Tramlink with the London Underground after Wimbledon. 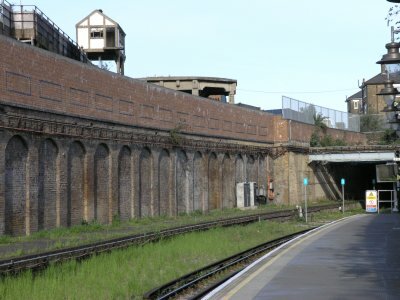 There is however some debate at the moment as to whether the East London Line would remain as part of the London Underground - it may well be re-opened as a suburban railway franchised by TfL to a private operator, but nothing is for sure at the moment. 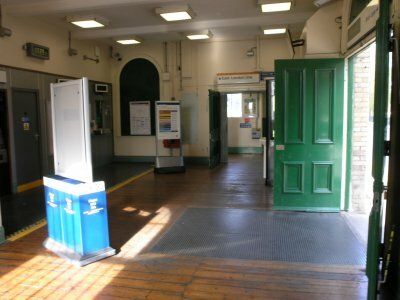 Shoreditch station is not remarkable in and of itself as a London Underground station. 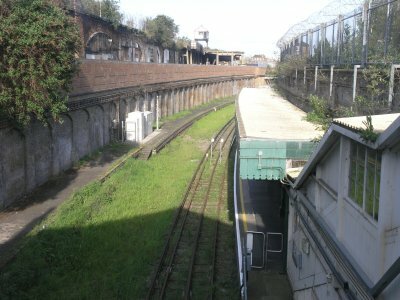 The entire station is above surface located in a cutting with the station building itself built over the section that would originally have continued on to join the mainline track to Liverpool Street. The entrance is situated down a short path leading off Brick Lane. 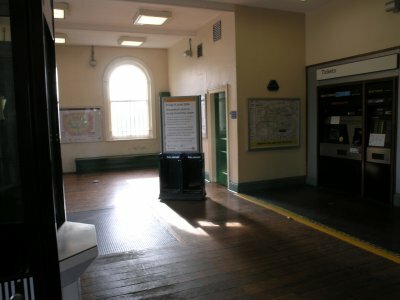 Inside the station, were it not for the modern ticket vending machinery, you could be forgiven for thinking that the station had become lost in time - I'm sure very little has changed in the booking office over the years, with its wooden flooring and period decorations. 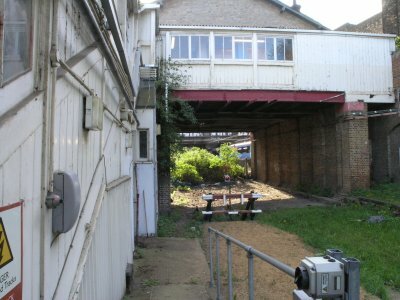 The station building itself forms a bridge over the line which would originally have formed a walkway to the second platform, but since electrification this platform has not been used - today there is no public access to it and the tracks have long since been lifted, leaving a grassy strip. The platform itself also showed signs of many years of disuse, with tufts of grass growing from cracks. Trains terminated on the existing platform, with the tracks running just beyond. 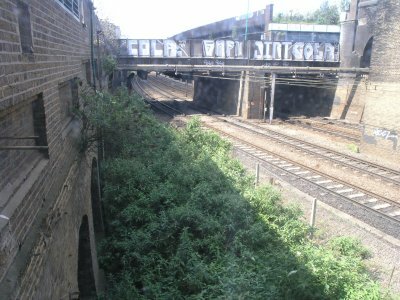 Evidence that the tracks originally ran further, joining the mainline just beyond the station could be clearly seen on the west part of the station. Looking down from a window in the booking office, the location of the junction with the mainline could clearly be seen clearly, though the tracks themselves had long since been removed. As soon as the station closed, preparetory work commenced for the access to the flyover. In this next picture the flyover can be seen to the left of the station along with an abandoned signal box. Much of the space currently occupied with the station will be used to build this access ramp. I was there on the final night when the station closed to the public for the final time. See here for a description of the visit along with some pictures I and others took of the closure day. Shoreditch station photographs were taken on 29th & 30th April 2006, shortly prior to closure. All material on this page is © 2006 Hywel Williams unless otherwise noted.